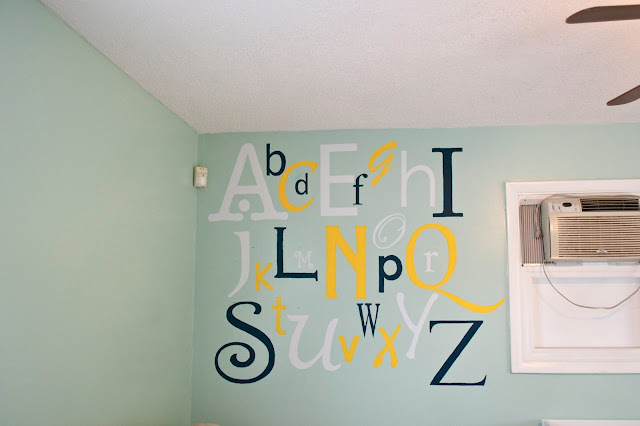 A couple of weeks ago I showed you our Alphabet wall mural for the baby's room. It is now finished after 2-3 coats of paint were applied (depending on the color). The alphabet is only on one side of this wall and since our lives basically revolve around math and physics you didn't think we were going to ignore the numbers did you? The other side of the wall is the dedicated numbers area, but we couldn't just do numbers... it had to be something special. We went through a couple of different ideas of how we could incorporate something mathy without being too abstract. We finally landed on the Fibonacci spiral. 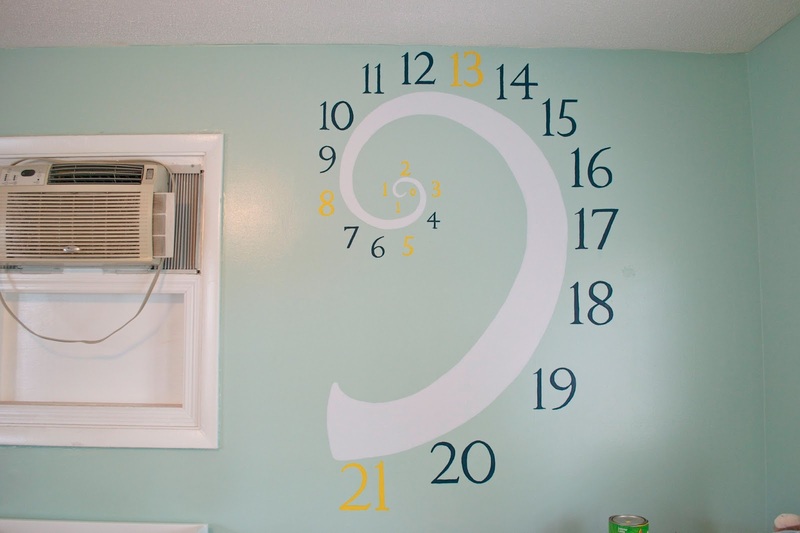 Using the spiral as the guide, I was able to include all the numbers (up to 21) and then use the yellow paint to highlight the Fibonacci numbers. If you aren't familiar with the Fibonacci sequence, it's fairly simple. The first two numbers are 0 and 1 and then all the following numbers are the sum of the previous two. This results in a sequence of 0, 1, 1, 2, 3, 5, 8, 13, 21.... and it is a sequence that shows up in nature quite a bit. The spiral is often called the golden spiral and it can be seen in the pattern of sunflower seeds, galaxies, flower petals and many many other places. What I really like about this is that besides the double 1 (which is quite small) it looks like we just decided to put the numbers up in an interesting pattern but it subtly has a lot more to it. It took a lot of nights of tracing and painting but the wall mural is now complete. Here is both sides of the wall. We do have furniture in the room now but the room is a hot mess as we try to get organized so we're not quite ready to show you all that. This mural being finished is a huge check off the list . It definitely wasn't a hard project but it was time consuming. While we've been working on this project, we have also been working on a lot of other stuff that we'll share with you later. Our checklist for this room is getting shorter (and getting down to the really small projects) but we still need to do the following. After that it's just a lot of organizing and making the nursery uber cute! What a cute idea! 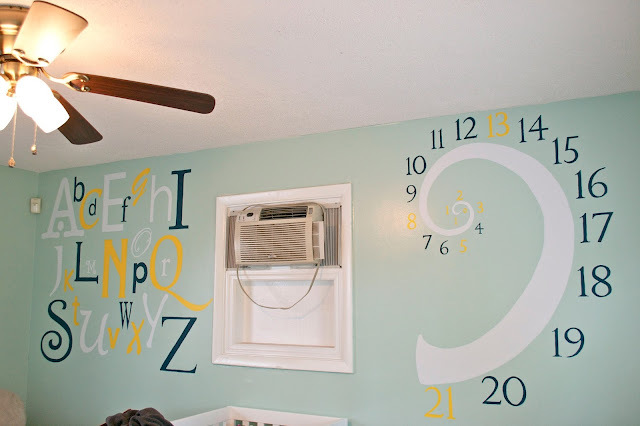 Unique way to add some cute geekiness to the room! :) Love it. The alphabet AND math! What a well rounded baby you'll have ;). Very nice! Thanks so much for the comment! I projected a Google image of the Fibonacci spiral up on the wal and traced it for the outer edge and then free handed the inner edge. I used a pencil and just tried to increase the width evenly as I went. Love this! 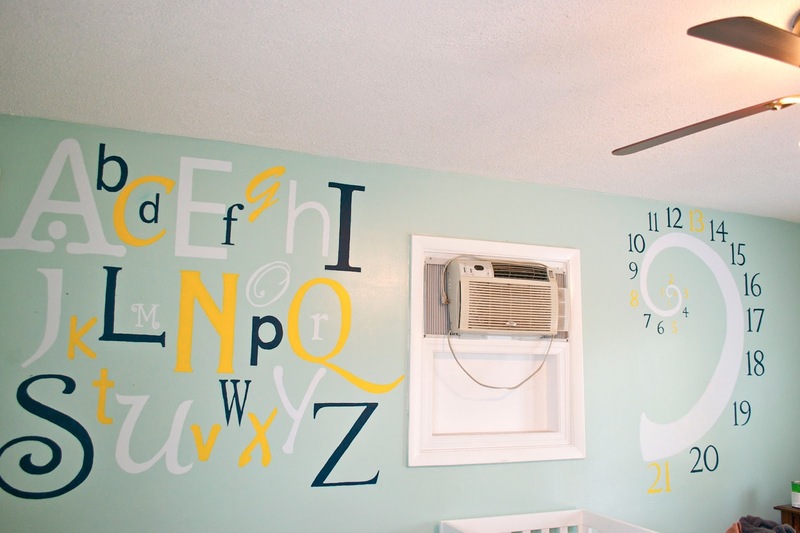 Super adorable and I LOVE the color scheme. Do you mind if I ask what specific paint colors you've used? Very cool. Love the color choices.